And that's it from us. 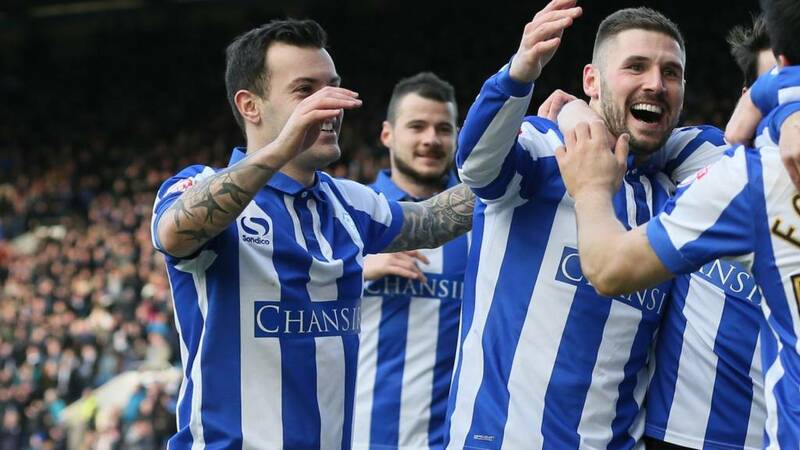 Sheffield Wednesday move into the top six thanks to a double from Gary Hooper. Yorkshire rivals Leeds remain 12 points outside the play-off places. Enjoy the rest of your weekend. Cheers! Sheffield Wednesday striker Gary Hooper told Sky Sports: "It's the last game of my loan spell but I'd like to stay. I'm playing and scoring goals. "I'm happy here but we've just got to see what happens now." Sheffield Wednesday forward Fernando Forestieri told Sky Sports: "The team played with the right mentality and that's good. "This game is for the fans because they gave us a lot of support. "If we play like that then we can do something important for the club." The referee blows for full-time and Sheffield Wednesday move into the top six. Leeds dominated the first half but went behind just after the restart when Gary Hooper scrambled home. Hooper grabbed his second minutes later when Marco Silvestri spilled a Fernando Forestieri shot. Leeds thought they had got back in it when Liam Cooper scrambled home a free-kick with 12 minutes to go but it was disallowed in controversial circumstances after the referee failed to spot that the hosts had not completed a substitution. Four minutes to play and Sheffield Wednesday are heading into the top six. Gary Hooper can be content with his day's work and he'll watch the final few minutes of the game from the bench. Wednesday striker Gary Hooper tries his luck from the halfway line... It doesn't go in, I'll say that. Midfielder Ross Wallace makes way for Jeremy Helan. Leeds think they are back in with Liam Cooper scrambling home from a free-kick but the goal is disallowed with the Wednesday substitution not having been completed. From the re-take Scott Wootton has a header cleared off the line. There'll be no goal for Fernando Forestieri today. He's subbed off for Portugal international Lucas Joao. Mirco Antenucci comes on for Alex Murphy. The Italian forward is likely to go up front with Souleymane Doukara and you'd expect Leeds to switch to a 4-4-2 now. Daniel Pudil hacks down Giuseppe Bellusci as the Leeds man looks to motor into the Wednesday half. The free-kick is easily cleared. Leeds bring on midfielder Alex Mowatt for winger Mustapha Carayol. The Middlesbrough loanee had looked lively in the first half but his second half has mirrored that of his team. Leeds have hardly had a sniff this half but Souleymane Doukara shows they're not totally out of it with a fierce low strike from 18 yards that hits the outside of the post. I make that four shots from outside the area from Fernando Forestieri in this second half. The former Italy Under-21 man slices wide on this occasion but I suspect he might just try his luck again before the game is up. Leeds are going to have to get more men forward if they are going to get back in this game now. Stuart Dallas motors down the left and puts a n inviting cross into the Wednesday area but he has only Souleyman Doukara to aim for. Away midfielder Lewis Cook is in the book for a nasty tackle on Wednesday full-back Jack Hunt. The last thing Leeds now is to be reduced to 10-men. Huge amount of work for Leeds to do now. Have to say I did not see this coming at half-time but the Whites are going to have to do something drastic to get back in this match and the Owls are all over them this half. If the goalkeeping was bad on the first goal it's even worse this time around. Fernando Forestieri runs at Leeds and takes a shot from just outside the area, Marco Silvestri sees the ball bounce back off his body and Gary Hooper tucks in from six yards. Well, it's against the run of play but Sheffield Wednesday fans wont care. Leeds keeper Marco Silvestri needlessly concedes a corner when he spills a Fernando Forestieri shot around the post when the shot was clearly going wide. From the resultant corner Leeds fail to clear their lines and Forestieri gets a low cross into the area and Gary Hooper scrambles the ball in from all of three inches out.